Our Gardenia plants ship as available throughout the year are especially favorites during the holiday season for hostess and seasonal gifts. 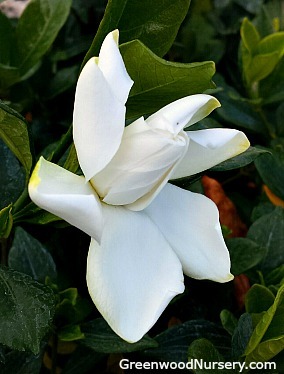 Southern climates are able to enjoy gardenias planted within the garden and landscape settings while cooler regions must grow them indoors over fall, winter and early spring. The wonderfully fragrant gardenia flowers are one of the most welcomed scents probably next to rose flowers. The Chuck Hayes Gardenia is an evergreen flowering shrub is round in shape and often used as a low hedge or lawn edging when planted outside. As a potted plant indoors, it is best to select the best spot where it will be growing more permanently as they do not like to be moved. At least half a day of direct sun where temperatures is about 55 F. and a bit warmer at night. Once heat is being used in your home, it's easy for gardenias to dry out. Spraying a light mist of water on the foliage in the mornings help to keep i hydrated. Click here for tips on growing gardenias indoors. Why does your gardenia have yellow leaves? Chuck Hayes Gardenia is grown in a one gallon pot. Orders shipping to CA or AZ will be bare rooted before being prepped for shipping.